Pink plaid nail art | Light Your Nails! Today I am showing you the draft of a nail art, if I can call it that way. I started with Catrice ICONails n. 11 Go For Gold! and stamped it a plaid pattern in pink. I actually wanted to add some fuchsia flowers over it but I am not ready for more difficult steps I guess. I made a mess and had to remove everything. I am still showing you this half-done mani! 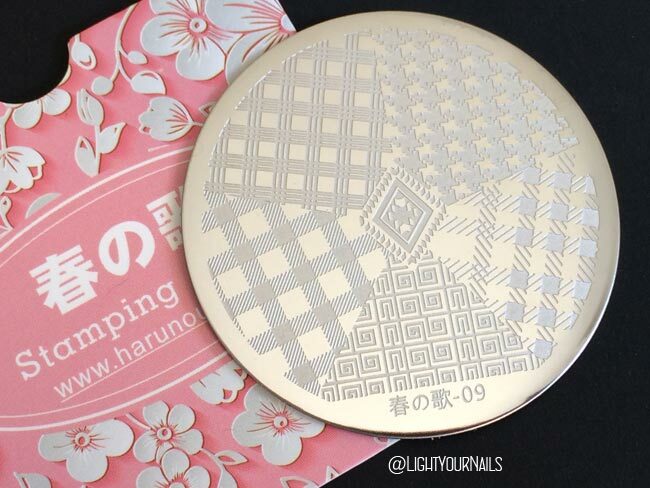 The plaid pattern comes from Harunouta-09* stamping plate from Bornpretty/Nurbesten. These designs always inspire me more wintery manis to be honest. Fortunately the colours I used this time are not wintery at all! The plate is so pretty if you like the genre, and works great as usual. The pink stamping polish is also by Bornpretty (no. 16 in the 6ml bottles range) and works perfectly. I can totally recommend both products. I think that’s it today, I’m ready to dive into the week-end. What about you? I'm gonna have to copy this... it's stunning! So sweet and girly, but with a kick and some oomph, I love it! Thank you so much, I'm so glad it was inspiring! Mi piace molto questo tipo di stamping,poi hai scelto il rosa che ci sta davvero benissimo! Rosa com dourado é perfeito. Pink and gold is such a lovely color combo and is not used enough. I love how delicate yet bold this is! Beautiful stamping job. Love the subtlety of the colors you chose. Pretty! This is such a feminine and fun look! I just got a bunch of Born Pretty Store stamping polish in the mail today - I have been so impressed with how opaque they have looked in your posts and I can't wait to try them! I am sure you will love them, can't wait to read your review! Grazie Freya! Lo stamping sembra difficile all'inizio, ma con dei buoni prodotti ci si prende la mano subito!